GOLDEN, CO--(Marketwired - Jan 14, 2015) - iSatori, Inc. (OTCQB: IFIT), an emerging leader in the development and marketing of scientifically engineered nutritional supplements for healthier lifestyles, today announced the launch of its newest weight-loss innovation called DygloTrim, featuring patented Dyglomera®, nationally with America's largest retailer of specialty supplements, GNC (www.GNC.com). The Company has built a strong reputation for creating scientifically engineered, clinically effective weight-loss supplements through its BioGenetic Laboratories division, as evidenced by its numerous top-selling diet support supplements. The Company has already received sizable orders from GNC for Dyglotrim™, and recently shipped those orders. Founder and Chief Executive Officer of iSatori (www.isatori.com), Stephen Adele, commented, "DygloTrim has already been well received by consumers, reaching the number one, top-selling spot in the 'New Arrivals' diet category on GNC.com, likely due to the impressive scientific results for the patented Dyglomera® weight-loss ingredient." "Our goal at iSatori is to help America go from the fattest to the fitness nation. We remain committed with our BioGenetic Laboratories' branded products to address the serious need of over 65 million dieters in America struggling to lose unhealthy body weight, which represents a $38-billion addressable market," noted Collin Cogdill, industry veteran and VP, Strategic Brand Manager for BioGenetic Laboratories at iSatori, Inc.
"DygloTrim is based on its key ingredient, Dyglomera®, which produces some of the most significant weight-loss results seen by any of our scientific advisors," explains Cogdill. "In a randomized, double-blind, placebo-controlled trial -- the 'gold standard' of clinical research -- 318 participants demonstrated remarkable combined results in substantial body-weight reduction in just eight weeks. At the end of the study, the Dyglomera group lost an average of 24.5 pounds and reduced body fat along with waist and hip circumference by over 10 times compared to the placebo group. It's important to note that these were not outliers: they were participants' averages in weight loss." iSatori began shipping DygloTrim™ to retailers earlier this month, and the product is now available nationwide at GNC stores (and online at GNC.com), the world's largest specialty supplement retailer, with over 6,000 stores in the U.S. and locations in 49 other countries. Consumers interested in finding out more about DygloTrim™ are directed to the Biogenetic Laboratories website at www.BioGeneticLabs.com and encouraged to sign up to receive emails with helpful resources, tools, and tips to support their goals. Or they can order direct by calling 1-888-752-6615. Those seeking weight-loss education and support, and additional product information on DygloTrim™, should visit their social community support site at http://www.facebook.com/BiogeneticLabs. iSatori is a consumer products firm that develops and sells scientifically engineered nutritional products through online marketing, Fortune 500 retailers, and thousands of retail stores around the world. The Company is headquartered in Golden, Colorado, and its common stock trades on the OTCQB under the symbol "IFIT." More information about the Company is available at http://www.isatori.com. Statements made in this news release relating to the Company's future sales, expenses, revenue, product developments, and all other statements except statements of historical fact, are forward-looking statements within the meaning of Section 27A of the Securities Act of 1933 and Section 21E of the Securities Exchange Act of 1934. We have used the words "anticipate," "believe," "could," "estimate," "expect," "intend," "may," "plan," "predict," "project," "should," "will," "potential," and similar terms and phrases to identify forward-looking statements in this press release. These statements are based on assumptions and estimates that management believes are reasonable based on currently available information; however, management's assumptions and the Company's future performance are both subject to a wide range of business risks and uncertainties, and there is no assurance that these goals and projections can or will be met. Any number of factors could cause actual results to differ materially from those in the forward-looking statements, including, but not limited to, the timing and extent of changes in demand for the Company's products, the availability and price of ingredients necessary to manufacture such products, and the outcome of any current or future litigation regarding such products or similar products of competitors. Please see our Risk Factor disclosures included in our Registration Statement on Form S-1, as amended, initially filed with the Securities and Exchange Commission on April 30, 2013, and in subsequent filings with the Securities and Exchange Commission. All future written or oral forward-looking statements attributable to us or persons acting on our behalf are expressly qualified in their entirety by the previous statements. The forward-looking statements herein speak as of the date of this press release. We undertake no obligation to update any information contained herein or to publicly release the results of any revisions to any forward-looking statements that may be made to reflect events or circumstances that occur, or that we become aware of, after the date of this press release. Individual results will vary. Always consult a physician prior to starting any diet or exercise program. These statements have not been evaluated by the FDA. This product is not intended to diagnose, treat, cure, or prevent any disease. 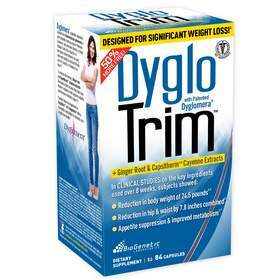 DygloTrim is based on its key ingredient, Dyglomera®, which produces some of the most significant weight-loss results seen by scientific advisors.